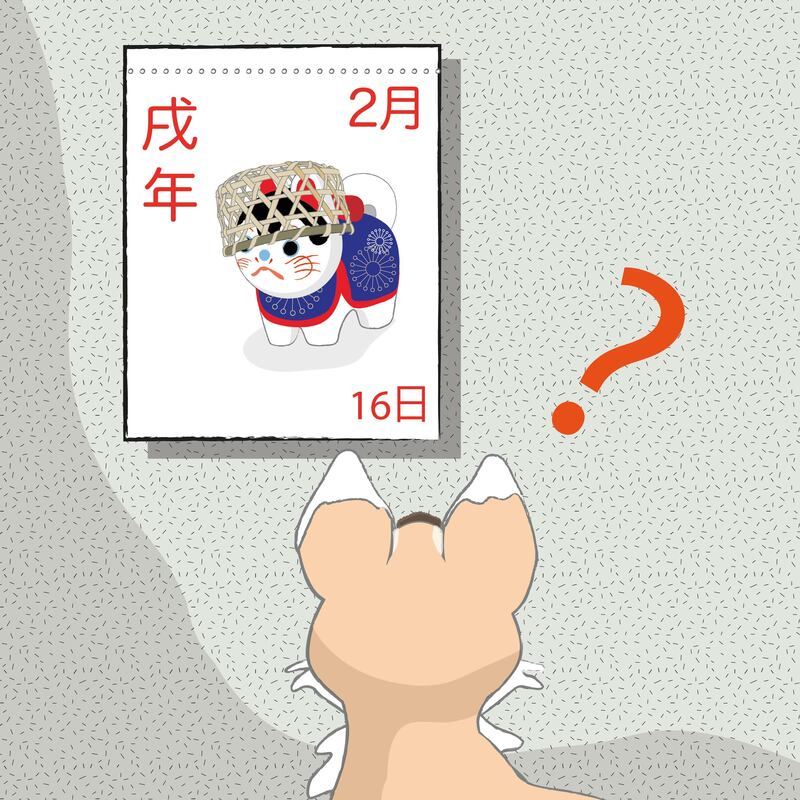 On 16th February, Kiku noticed the kitchen calendar showing that it was Chinese New Year for 2018, and the start of the year of the dog, known as ‘inu doshi’ (戌年/ いぬ どし)1 in Japanese – but he was confused by the picture – what appeared to him to be a cute cat with a bamboo basket on its head. Later on he asked Boss Panda why the zodiac animal years seemed to have two different starts, and what a cat with a basket on its head had to do with the year of the dog. Boss Panda explained, “In Japan, the beginning of the lunar New Year as celebrated in China is not a public holiday, and only really celebrated in places like Yokohama’s Chinatown. The New Year in Japan is now celebrated at the beginning of January according to the Gregorian calendar (after the Japanese moved to this calendar in 1873), but Japanese people still mark the beginning of the lunar New Year with the setsubun rituals and customs. In Japan this used to be celebrated the day before Chinese New Year, but these days it has been fixed as February 3rd, rather than moving along with the date of the actual Chinese New Year. 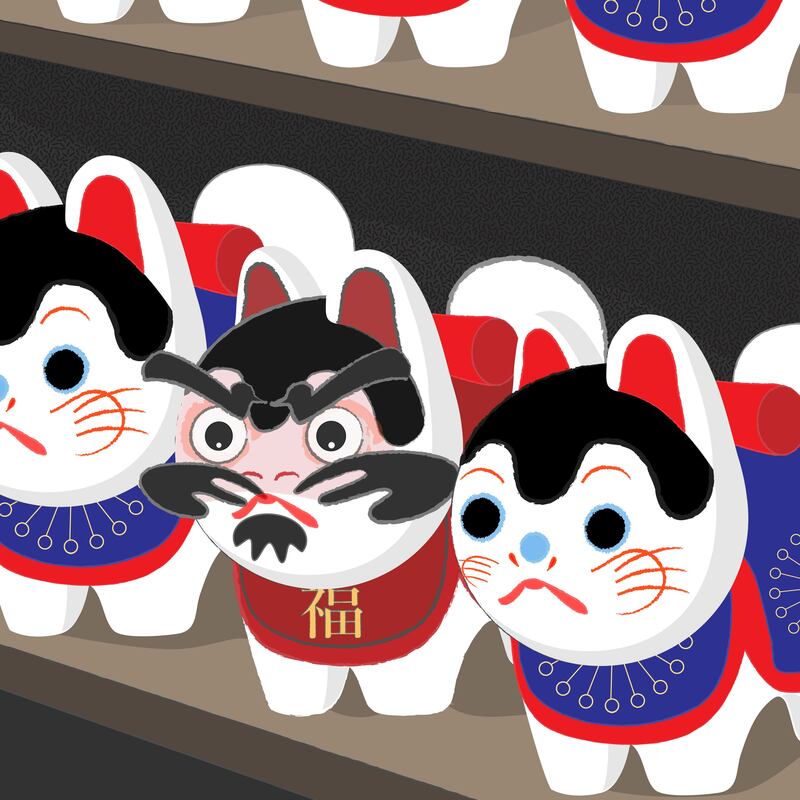 The zodiac animals are still recognised each year (for example on New Year greetings cards), and people also buy objects or themed items that represent the current year, such as hariko2 figures, stationery and foods with special packaging. Looking at the picture again, Kiku could see the toy as being a cute Japanese dog, but was still confused by the basket placed on top of the dog’s head. 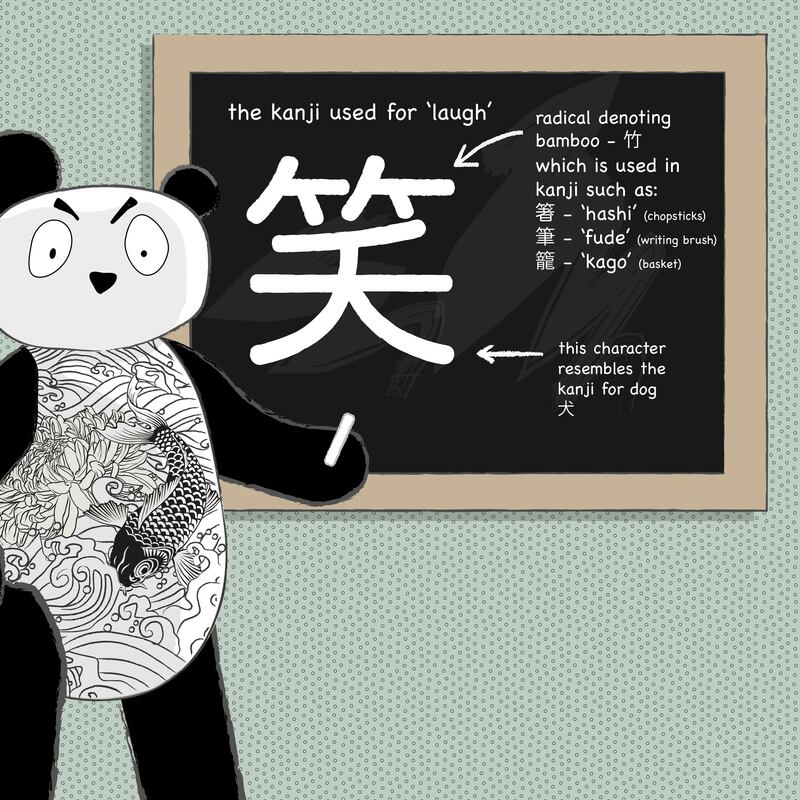 “This is a kind of visual pun based on the kanji for ‘laugh’”, Boss Panda told him, as he went over to the chalkboard and drew a large kanji to explain. 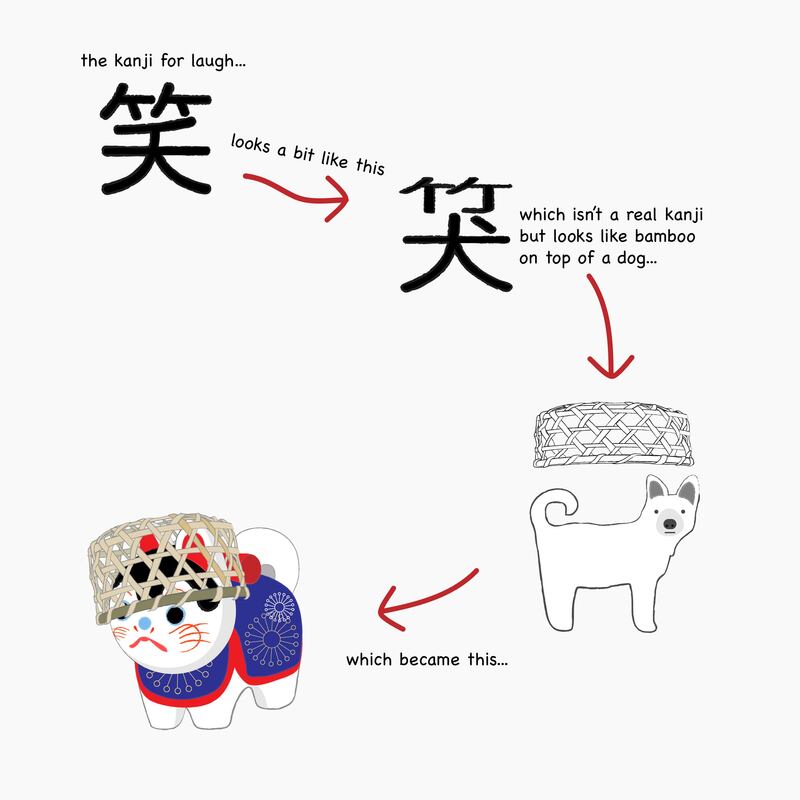 “The kanji for “laugh” can be split into two parts, with the top being the kanji for “bamboo”3 and the bottom looking very similar to that for “dog.” And so this figure came about to make you laugh when you see it, as it is a sort of literal interpretation of the word. The toy version is known as a zaru kaburi inu (ざるかぶり犬) or ‘basket on head dog’. Dogs are loyal, family orientated and good-natured but can come across as stubborn. 1 In Japanese, a dog is “inu” and is written as “犬” in kanji. In the animal zodiac version, however, a different kanji is used: “戌”. 2 Hariko is the Japanese term for a folk craft similar to papier-mâché that differs from region to region – layers of washi paper are pasted either over or into a mould or over wooden frames before being painted with gofun (a type of whitewash made with the powder from oyster shells) and glue and then colour. 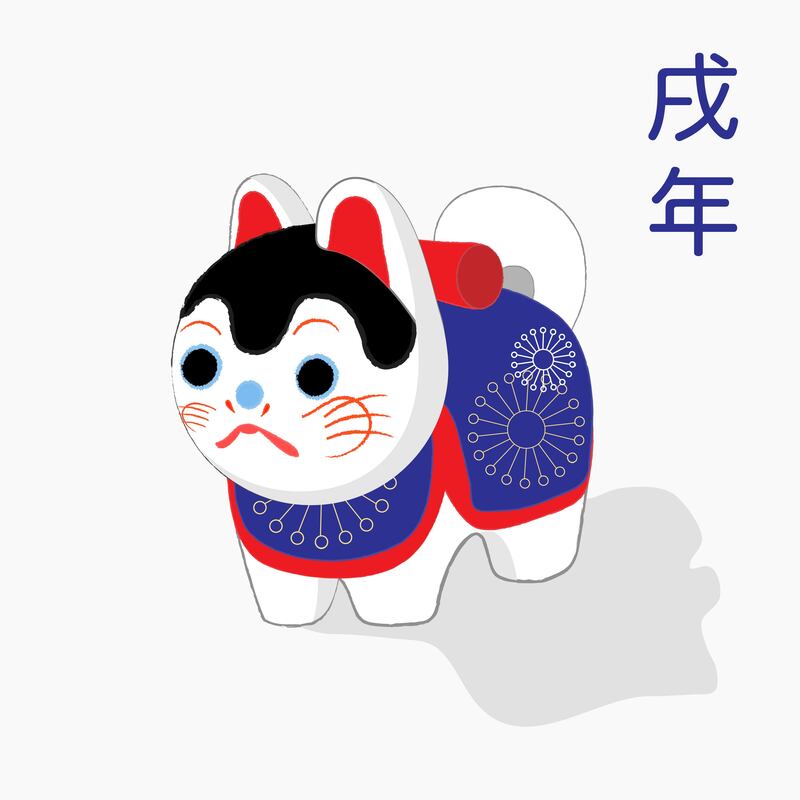 The inu hariko figure is often mistaken for a cat outside of Japan because of its rounded cute features, but actually represents a native Japanese dog – hence the small curled over tail. 3 the bamboo/ take radical was not the original radical at the top of the kanji for laugh, but it is thought to have developed into it from the grass radical instead. In Kanji dictionaries, kanji are classified based on their main component, known as a radical. There is only one radical per kanji, and each one has a meaning, which it lends to the kanji of which it is a part. There are 214 classical radicals, and they can be found in one of seven different positions within the kanji. The one which is a compressed form of ‘take’ or bamboo is calledたけかんむり/ takekanmuri, and like the bamboo kanji it looks a little like two culms of bamboo with leaves. Other examples of kanji that use this radical at the top are those for ‘chopsticks’, ‘brush’ and ‘basket’– all things once made from bamboo, so you see that this radical can sometimes indicate that the kanji is bamboo related (or a word that may have the characteristic of bamboo). However, it can often be hard to work them out if it isn’t entirely obvious what the origin might have been – such as in words like calculation (算), which originally meant using a bamboo abacus. Another delightful and informative story! !